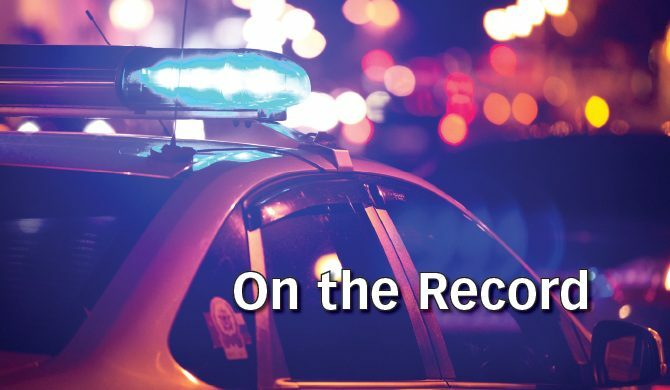 12:23 a.m. At the intersection of East Seventh and Tucker streets, Craig Police Department officers responded to a report of suspicious people in the area. When officers arrived, they found two people arguing. The people were asked to leave. 2:48 a.m. On the 400 block of Ranney Street, police found a man looking through a dumpster. When asked why he was searching the dumpster, the man said he was looking for something he lost. Police asked him to leave. 7:57 a.m. At the intersection of Russell and East Fourth streets, vehicles were towed to allow city workers chip seal the street. 11:28 a.m. At the intersection of Barclay and Seventh streets, police found a drunken man wandering around. The man was picked up by a sober family member. 6:21 p.m. At the intersection of Riford and Westridge roads, a caller reported seeing a drunken driver. Officers were unable to locate the driver. 8:03 p.m. At a business on the 1100 block of Victory Way, a caller reported seeing a drunken driver. Officers spoke with the driver and determined he or she was not drunk, but was experiencing vehicle problems. 8:50 p.m. At the Davis House, officers arrested a 58-year-old Craig man on a warrant. 11:12 p.m. On the 300 block of Woodbury Drive, a caller reported seeing a suspicious person in the area. Officers were unable to locate the person.